If you were upset about not getting to watch the final episodes of Caprica, Syfy is going to give you the opportunity to see them... as long as you can wait 'til next year. Syfy's cancelation of Caprica, the prequel to the much-beloved Battlestar Galactica, left fans wondering when they'd get to watch the final few episodes. The network has now revealed that it will be airing the episodes, but it'll be a little while. 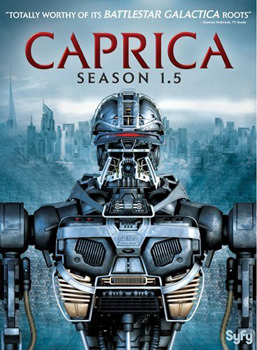 Last week, the network announced that the five unaired Caprica episodes will be broadcast on Tuesday, January 4, from 6 PM to 11 PM. The show was unceremoniously canceled only a few episodes into the second half of its first season. In a weird twist, the cancellation was announced right after the channel ordered a pilot for a different Battlestar prequel called Blood & Chrome (which is set after Caprica but before the main series). It should be noted that the episodes' airing time is kind of bizarre, since Caprica Season 1.5 is going to be released on December 21st. On top of that, Canada's Space Channel has also continued to air episodes in spite of the series' cancellation. Still, at least Syfy will provide fans with some closure before Blood & Chrome hits the airwaves.